As parents, we hate to see our little ones upset and in pain, especially when there’s little we can do to help them. So when Isla started to suffer from eczema when she was only 4 months old, it was awful to see her suffering.It started to appear on Boxing Day when we were visiting Hubs’ side of the family, first on her forehead, cheeks and chest, and throughout January it got worse and spread. 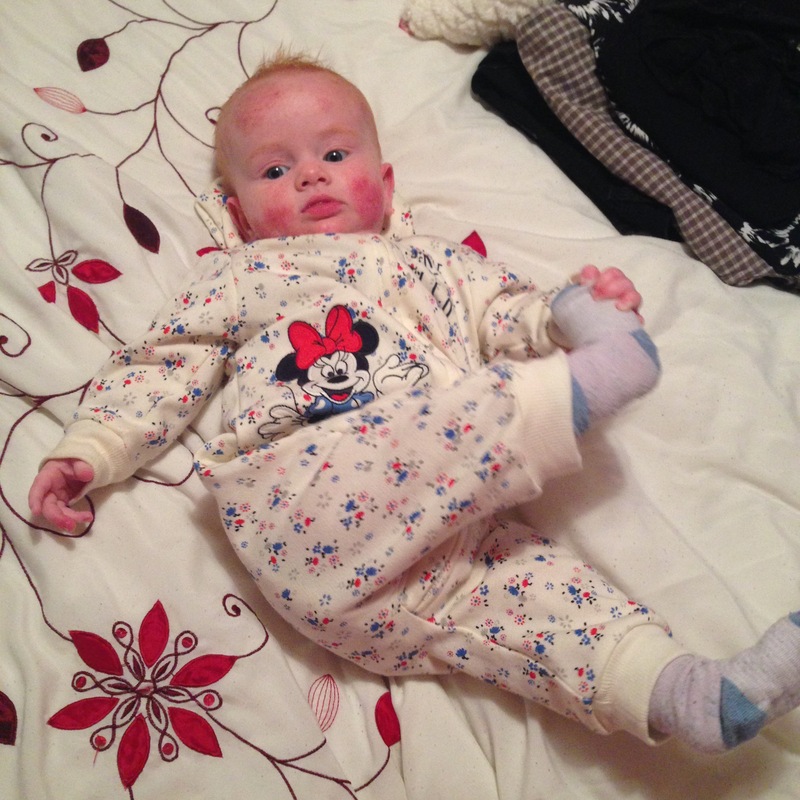 In the first photo taken in February when she was 5 months old the eczema was at its worst, and it caused her such distress. We’d trim her nails constantly and put socks on her hands day and night to stop her scratching (mittens were so pointless as they fell off within minutes!) but despite our efforts, she’d constantly scratch her cheeks and legs until they bled, and her bed sheet would be covered in blood the next morning. We had a real battle with the doctors to get her better. We were given so many different lotions, steroid creams and bath oils, none of which were any help, by four different doctors who tried to say that it was just dry skin and it would go away on its own, despite my insistence that she was miserable. I then went down the natural route of using olive oil (recommended by a health visitor), coconut oil (which was great at shifting her cradle cap) and aloe Vera creams but nothing worked and every time we tried something new, it just inflamed her skin more. Even worse, when we finally found a doctor who took me seriously and diagnosed her with eczema, we were told that we’d have to wait 7 months to see a dermatologist on the NHS! I couldn’t bear to see my baby girl in such discomfort any more, so we were referred to a private doctor in May where, thankfully, we finally got to the route of the problem. It took a while to be taken seriously, as the first few doctors dismissed it as just “dry skin” and that all babies get it, but I wasn’t happy as her skin was making her so miserable. So I’d always say that if you’re not being listened to by your doctor, insist on being heard.